The Green Mountain State offers some of the best skiing in the Northeast, big mountains, great views, and charming resorts and ski towns for end of the ski day amusements. Bolton Valley Resort boasts great views of the Green Mountains, western lying Lake Champlain and NY’s Adirondacks. Bolton, now under local ownership, has expanded its skiing terrain to encompass glades and a quad chair to the summit. 3 Terrain Parks and a self-contained village round out the experience. Bolton tends to be less crowded and affordable for families. Bolton also boasts the first wind turbine at a Vermont ski resort. Bolton offers Vermont’s only night skiing on 10 trails and 3 terrain parks Wednesday – Saturday nights. Bromley has a family friendly atmosphere with great learning programs, a central base lodge with convenient parking and a variety of terrain. With affordable midweek/non-holiday lift tickets, Bromley is a deal. The southern exposure makes it a sunny mountain too. The history of Bromley is beer worthy, since it was founded by Fred Pabst of Pabst Brewing – aka PBR. Burke has long served as a training mountain for Burke Academy ski racers. The terrain is impressive, and the setting in Vermont’s Northeast Kingdom is awesome. A new Hotel Burke debuts, two high-speed quads cover the 2,011′ vert., with enhancements to snowmaking and glades – but still the same classic vibe, very few skiers, nd gorgeous views make this Vermont’s best kept secret. This Private Club opened in 2011, with 1500 memberships available for private skiing on Haystack Mountain, access to a magnificent Clubhouse, concierge service and ski valet. Like the Yellowstone Club of the East, this ski resort offers the well-heeled in ski boots a place to play and belong with out lift lines or crowded base lodges. Skiing is for members only. 6 Lifts, Cat Skiing and Snowmobiling, Nordic and snowshoeing, ice skating and tubing. Jay has the reputation as the snowiest mountain in the Northeast. The summit Aerial Tramway is a unique ride to the summit, where you can ski classic groomed slopes or venture into Jay’s expansive glade terrain. Three new slopeside Hotels, Tram Haus Lodge and Spa with Tower Bar – like Snowbird’s version is open along with a upscale Hotel Jay and the affordable Stateside Hotel. Jay Peak also sports nice mountainside condos to make this northern ski vacation complete. Kids will love the amazing indoor waterpark -The Pumphouse, and full size ice rink- The Ice Haus, while parents will like the all-inclusive pricing, and après ski at Foundry, Bullwheel, or Tower Bar by the Tram. Killington is the largest ski and snowboard resort in the eastern United States, with monstrous snowmaking capacity and seven mountains of interconnected terrain. Also legendary is the nightlife and restaurants that line the Access Road. Killington has ramped up its family offerings at Ram’s Head and Snowshed, and designated the entire Bear Peak for freeriders and skiers looking for parks, pipes and bumps. Killington opened first in the East 2016-2013, and typically keeps skiing until late, Memorial Day in May! Now owned by SP Land and Powdr Corp., Killington continues to work on a new base village, new summit Peak Lodge, and interconnected lifts and trails with neighboring Pico. Mad River Glen is a retro ski area, managed by a purist co-operative of skiers. No snowboarders allowed. With the landmark Single Chair, one of two in all of North America, Mad River is about classic unadorned ski terrain, hence the slogan, ski it if you can. While you won’t find fancy lifts or high tech snowmaking, the un-crowded environment and genuine heart of this ski area is special. Mad River Glen works hard to stay behind the times. Magic Mountain has family-fun terrain plus natural steeps and glades if you follow a local who knows where to go. The Hocus Pocus Terrain Park and Alakazzam Tubing Park give kids additional places to play while parents enjoy après ski at the BLT. The Upper Pass Lodge offers Ski and Stay deals for families. Open Thursday-Sunday for old school skiing. TimberQuest is Magic’s new adventure Tree-versing park with ziplining and obstacle course fun. Magic went co-op like Mad River Glen, and raised $1 million in its Magic Partnership, and is now investing in snowmaking. The Middlebury College Snow Bowl is steeped in NCAA tradition, owned and operated by the Ivy League college. Open to the public, the ticket prices are super low, for a pretty high fun factor. And you can watch the Panthers race gates on training days. Mount Snow has a half century of great skiing and socializing tradition. Now owned by Peak Resorts, the ski area has the Longest Terrain Park in the East located on its own mountain – Carinthia. With over 80 trails and 20 lifts including a new high-speed six-person bubble chair, the most fan gun snowmaking in North America, expert childcare and lesson programs, and a Grand Summit Resort Hotel, Mount Snow has all the makings for a great ski getaway. Okemo Mountain Resort is known for their exceptional snowmaking and grooming, high speed lifts including two new bubble covered chairs, loads of slopeside lodging and a hotel, the skiing stretches across four miles, and the views carry over the Green Mountains and the picturesque Ludlow Valley. The Mueller family operates this resort and continues to improve upon a great family ski resort with excellent kids ski school and events. The Jackson Gore base includes an impressive full service Inn, residences in the Adams House, an ice-skating rink – The Ice House, and fitness and aquatic center – The Watering Hole, and a Mountain Coaster called the Timber Ripper. Pico Mountain has a warm, historical feel, but offers modern lifts, sweeping trails and fantastic summit views at 3,967′. Sister resort to Killington Resort, Pico offers a quieter ski experience with one central base and walk to slope lodging with a Sports Center. Smugglers’ has over 50 years in the ski biz, and a mountain of awards for family programs. With three interconnected ski mountains reached by authentic double chairs, and a bustling resort village, families find an outdoor oasis at this northern Vermont setting. What sets Smugglers’ apart from other resorts is the incredible staff of caring counselors, and endless activities – learn to ski, to après ski science class, and a FunZone. A cast of characters including Mogul Mouse and Good Time Charlie keep the whole gang entertained on and off the slopes. Stowe is the quintessential ski resort town in New England. And with the highest peak in Vermont, the skiing on Mt Mansfield is formidable, especially on the Front Four. Stowe is the Deer Valley of the East, with a new gondola, a new village at Spruce Peak, The Stowe Mountain Lodge and posh mountainside homes. What hasn’t changed about Stowe (Ski Capital of the East) is the classic terrain, and the charming town and Mountain Road of entertaining shops and restaurants. 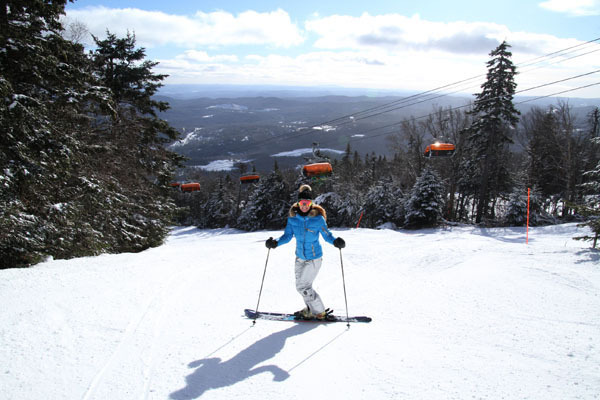 Stratton is a sprawling ski area, served by 4 – 6 pack chairlifts and a summit gondola. Stratton is the meeting spot of sophisticated families from away, and it’s a great place to play whether you like groomed cruisers or glades and terrain parks that hosted the US Open and has inspired native Burton snowboarders and fans. The Village at Stratton, developed by Intrawest is charming, almost European. Sugarbush encompasses 4,000 acres and a five-mile expanse of two mountains connected by the Slide Brook transport lift. The terrain is diverse from hard-core backcountry in Slide Brook and Castle Rock, to scenic cruising on Mt Ellen. The new Lincoln Village has brought a Sugarbush revitalization, with Timbers Restaurant and the Clay Brook Inn. Mount Ellen offers cat skiing – the only Eastern resort to do so. Located in the beautiful Mad River Valley, Sugarbush should be on your must ski list. The first rope tow in America was rigged here. Now this classic ski hill continues the tradition of classic skiing and kinship. Owned by The Woodstock Inn, the winter experience includes gracious lodging in at the 4-diamond Inn, skiing off the two chairs of well-pitched slopes and touring miles of scenic cross-country trails. And there’s the historic hamlet of Woodstock to shop and explore where the Rockefeller family settled to cap off your winter wanderlust. Ascutney Ski Resort in Brownsville Vermont may open thanks to a homeowner association and town support. Ascutney has not operated for skiing since 2010 due to bankruptcy. For now Ascutney has hike to ski terrain, with all natural snow. Stay tuned for news on this 1,800′ vertical ski resort with on mountain lodging and condos that first opened in 1946.